Actor-turned-producer Sanjay Suri whose film ‘I AM’ won the National Film Award for ‘Best Hindi Film’ catches up with Aditya Raj Kaul on the recent accolades and challenges. TSI: How does it feel to have won the prestigious National Award for the Best Film even when the film has got enough international appreciation? 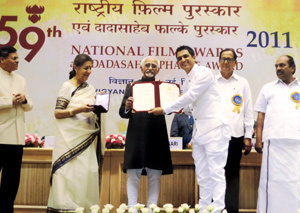 Sanjay Suri: Nothing else compares to the National Award. It is the most special and prestigious award one can get as a filmmaker. Yes, I AM has travelled to far corners of the world winning awards and accolades but truly this one feels different. It’s a validation of one’s efforts in an environment where Box office is the only parameter you are judged with. Someone along the way does lose faith if things don’t turn out the way one had imagined it to, but then an Award like the National Award helps you regain that faith and inspires you to continue on a path even if it’s less travelled. I am totally re-energized and inspired after this honour. TSI: How special was 'I Am' to you as an actor and a co-producer? Sanjay Suri: I AM is special to me in more than one way. As an actor it gave me the opportunity to delve into the mind of Abhimanyu (the character I play), an individual who was bruised at a very young age being a victim of Child Sexual Abuse. Such roles definitely sensitize me both as an actor and a human being. The same had happened to me when I had done My brother…NIKHIL. It helped me grow. As a producer, I wanted certain stories to be told that I have experienced, witnessed or seen or read in my own life or people around me and I have experienced the story of Megha. A story of displacement, loss of home, identity, etc. The courage required to revisit a past that was once lost for no fault of all these people including me. I always wanted to try to bring this emotion and reach out to a wider audience. I narrated each and every moment to my director friend Onir and then the writer Urmi Juvekar who eventually brought it out in the form of a screenplay. The fact that all four stories found a connect with the audience including the Jury which then awarded it the National Award for Best Hindi film has made me more at peace internally. TSI: Was 'I Am' an emotional experience since a story also revolved around your own early life in troubled valley of Kashmir? Sanjay Suri: Yes, right from the beginning it was an emotional experience for me. Emotions seem to flow whenever the word “Kashmir” springs up. Most of the emotions that I felt when I visited the valley after 18 long years were the trigger off point for I AM Megha. I wanted to capture a lot more but could only say a bit in those 22 minutes. It’s not possible to capture 22 years in 22 mins. TSI: Apart from your years in the field of acting, you've also turned into a producer now, but quite selective about choosing the projects. How has been the experience so far? Sanjay Suri: Well, I always say, “I am an actor by passion and producer by necessity”. Necessity because I wanted these stories to be told, but then who would produce stories that dealt with HIV, Homosexuality, Displacement, Child Abuse, Single parenthood, etc. It’s a big no no and considered suicidal in this box office driven environment. But today I am glad that I did what I did…and wish to thank all those who said no to produce these films because it’s given me much more than what I had imagined. TSI: What are the future projects you are working towards? Sanjay Suri: Both Onir and I produce together and our next project is called CHAURANGA, to be directed by a new director Bikas Mishra. It’s a story on a young Dalit boy falling in love with a 16-year old upper caste girl in a part of India that is not so shining! The script has been developed with the Binger Lab, Berlin Talent Campus, Film Bazaar Lab and has also won the Gotterborg International Script Development fund. Besides this there are 3 more projects that we are pitching and developing.